And like every other vacation night when sleep won't embrace me like it doesn't to a night owl because I've been a panda all day. At that time of the night when people of my age are on social networking sites, chating I on the other hand is on Pinterest, pinning and saving and getting inspired. From the time I have been introduced to Pinterest, I cannot stop, I simply cannot stop. It's the one stop destination for all your ideas be it fashion, craft, photography, food, travel and quotes. It is hands down my favourite! So while scrolling through I came across an outfit that I thought was very cute. Looking at which I knew I have to have this. Though it took me quite a while to find and put together the outfit, finally here it is! Namaslay everyone!🙏 How you doing! 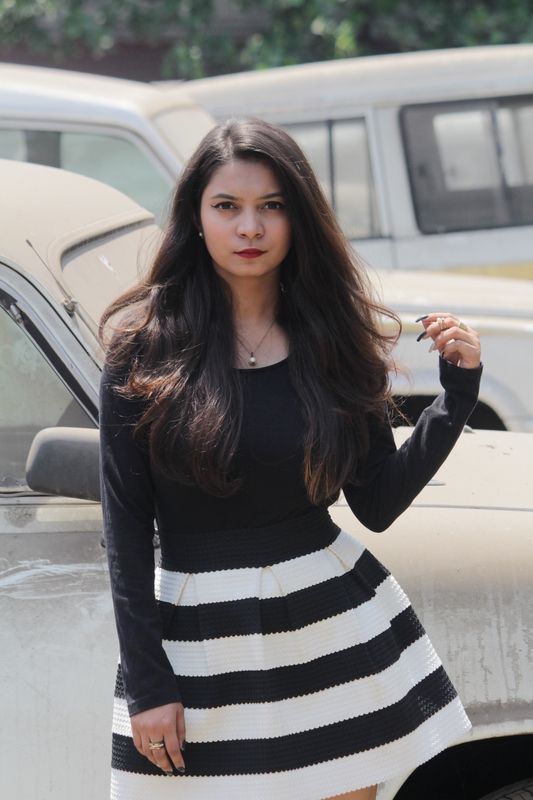 Today's blog is about this Pinterest inspired monochrome outfit. To anyone in doubt, it's​ not a dress. It's actually an outfit of two piece having a crop top and a skirt. Talking about the crop top first, it's from forever 21. 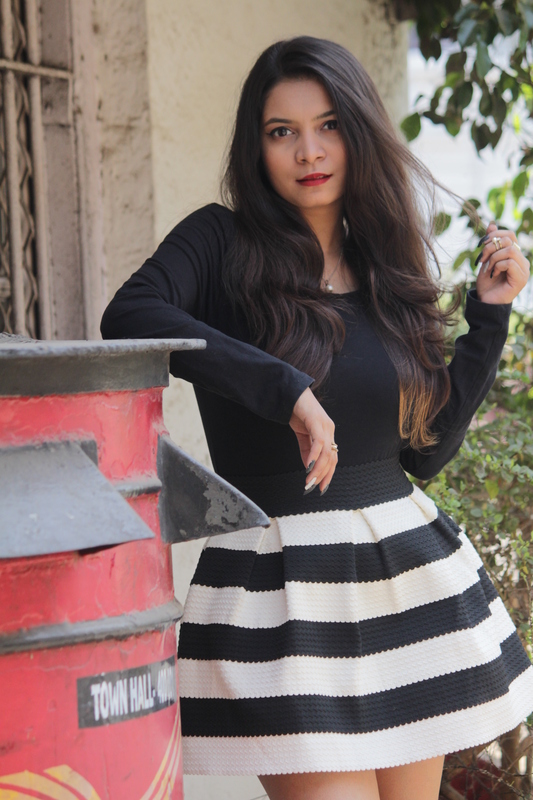 A basic black top is a must in your closet and this one is all that you need. It's nothing too fancy, a black full sleeved crop top which you can pair up with a lot of other things too. Coming to the best part of this #OOTD, the skirt. It's a very cute mini skirt. Again it is from forever 21. The fabric from which it is crafted is of very thick material which lets the flair stay and gives it that look. The skirt gives me "Imma Barbie girl, in my Barbie world" feels. I teamed the outfit up with stilletoes which is very important if you want to look tall but have a cute height like mine. They are from Hill road Bandra. I went minimal with accessories since I felt the look in itself was very bold. I had this thin silver chain with a pearl locket and stud pearl earrings. A few rings and a mid ring in hands and that was it. 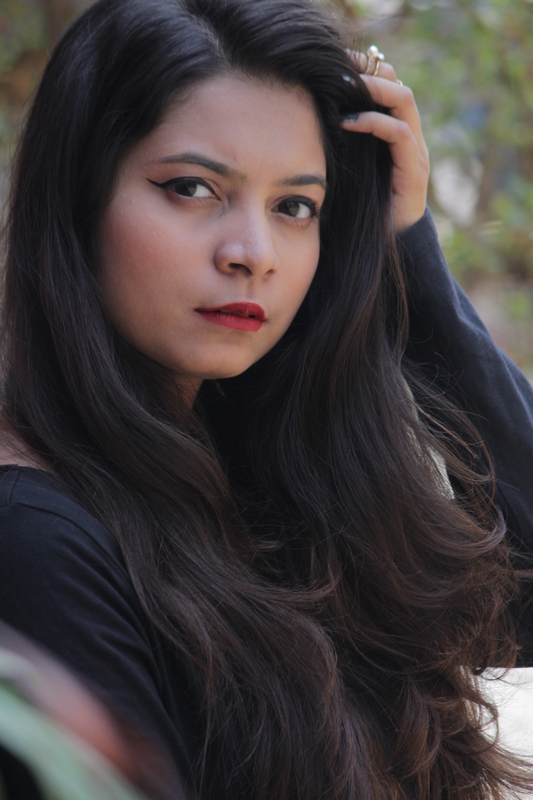 To complete the look I added a pop of colour with matte red lips This is how brought the virtual Pinterest outfit​ to life.🤗 Pictures by Bonita photography ( Haranish Mehta and Brooklyn afonso). Twist the look your way and tag me, Share your pintrest inspired look with me. Let's spread girl love and insipre each other. Let's come together and make a dope fam, the bomb fam. Also don't forget to follow me on all my social media profiles. Instagram/snapchat/Roposo/pintrest : the_baybomb Stay tuned for my next one, Till then stay bomb and keep slaying, More hope love and positivity to you, The Bay Bomb, Sonia Patel.